Hi everyone! Happy Labor Day to all you readers in the US! Every month I struggle with what I am going to write and wind up waiting till the end of the month to do my posting (and I am keeping that streak alive). In order to combat that, I came up with a series of topics on programming instruments, focusing on our power supplies. Let’s say that this is the first in a series of three (or maybe four I am not sure). Please note that anything that I state here is my opinion and not Agilent policy. Today I am going to focus on the how to send commands to your instrument. In other words, what sort of IO library do you use to send the commands? 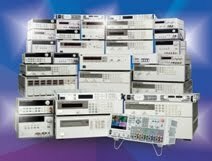 All of my suggestions will be based on the Agilent IO Libraries as that is the environment that I am most familiar with. There are two major options: direct IO where you use the SCPI from the instrument and drivers where there are functions that you call. It works pretty well and makes sense once you know it. The viPrintf and viScanf functions are very similar to some basic C functions so if you are a C programmer, this is really the way to go. In my opinion, this is easier to read than VISA. When I have to write a program now, I tend to stick with using VISA COM and Visual Basic. As you can see, the driver is much more complex than the direct IO examples. There are a few reasons to use a driver though. The first and most common reason is that your system itself it designed to use drivers. Another good reason is portability. There are instrument classes in the IVI driver that should work for any DC power supply that is compatible. One of the main downfall of our IVI drivers is that the functions almost always map 1 to 1 with SCPI so there are not many functions that work at a higher level and you don’t save any time programming there. My main approach is to use VISA COM in Visual Basic. I find it to be the easiest for me to program and it is what works for me. Of course no opinion is wrong though and we are happy that our readers are out there buying and programming our instruments. Thanks!